Boys attended school (which focused on studying the Scriptures) until age 13, and then typically learned a trade as an apprentice after that. Parents would start making arrangements for boys to do apprenticeships when they were young. After they finished school at 13, many would go and live with a tradesman’s family for a time, and they would earn their keep by doing chores and menial labor as they learned from the craftsman. Marriage was encouraged by about age 20. The Mishnah says that the time that some began to attend the bet midrash (house of study) which was a rabbi’s “school” or “study group” was about 15. Adults of all ages could come to listen in on the sessions (including women) when they had spare time, and there were quite a few who studied but never became teachers – they were still called “disciples” even at advanced ages. 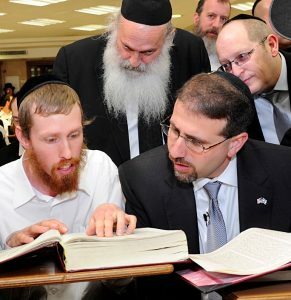 There were just a few who were dedicated enough to spend years of time in training to become rabbinic teachers themselves. Regarding fees – it was forbidden to charge a fee to teach the Torah, so it was common for rabbis to practice a trade part of the time and teach part of the time. Disciples did the same. Some rabbis were from priestly families, so they would have a stipend from the Temple, but many were manual laborers. There are many reports of teaching sessions held in the evening or on the Sabbath or festival days, so often men worked and studied at the same time. Some could work seasonally and take time off between planting and harvesting, etc. This makes sense with how the Gospel accounts describe the disciples fishing occasionally, even after they had become disciples of Jesus. Women often helped run the family farm or manage its business, giving the husband time to study. (Think of Proverbs 31, where the wife ran the business, and the husband “sat in the gate” – either in government affairs or in intellectual discussions.) Proverbs, of course, is from an earlier time, but the same thing was true in later Judaism – in pious families, the wife often would earn the money so that the man could spend his time in religious study. Extended families would also support a brother or son who was engaged in study too. Often disciples would travel together with a rabbi, and they would take weeks away to go on a teaching trip. A disciple had to ask his wife’s permission to be away from home to study longer than 30 days. When they traveled, rabbis and disciples would pool their money to buy food, etc. Jesus received contributions from wealthy women, and they were known for supporting other rabbis too. When they traveled, the villages they taught in were expected to extend hospitality, giving them food and shelter. My reference here is the chapter, “Education and the Study of Torah” in The Jewish People in the First Century, by Safrai & Stern (Van Gorcum, Brill.) Shmuel Safrai spent a lifetime engaging the original rabbinic texts, and distilled the results of his research here. It is the best scholarly source available on the topic. Another excellent source is New Light on the Difficult Words of Jesus, by David Bivin (En-Gedi, 2005). This paperback is a little more readable than the huge volume by Safrai. Thanku much appreciated info. Will share in on my Facebook with prayer and hope many in our country will learn these secrets. Eye opener to me too. What I am more specifically interested in is what is the distinction, or definition differences, if any, between a disciple, an apostle, and a rabbi? Are any of them ‘ordained’? Are all teachers? Was Paul a rabbi? Was John a rabbi? Thanks for any light you’ll shed on the subject. Pre 70-AD, the system not formalized. As I said above, people studied for many years and some went on to become teachers themselves. They didn’t go through a formal ordination process until post 70 AD. The title “rabbi” means ‘my master’ and it was used as a term of respect for a teacher. It was only after 70 AD that it became a formal title. An apostle is one who is “sent out.” It’s a New Testament term, not a word used in Jewish culture. I have a mentor friend of mine who explained to me that during a young boy’s Bar Mitzvah is when a Rabbi would choose to take him as a disciple and teach him. If the boy had not impressed upon any of the Rabbis then he would carry on to live a life as a tradesman of the trade of his father. Just as Joseph was a carpenter, so Jesus became one. He explained that Jesus did not impress into a Rabbi to become a disciple at the age of becoming a man. I like to learn these such things, however I also like to search things out. My main question is, is it true that a Rabbi would take a boy under his wing at the time of his Bar Mitzvah to teach him and if he isn’t chosen then yes he would go on to carry out a tradesman’s life? When one became a disciple of Rabbi, would it be the Rabbi’s responsibility to provide all things for the disciple, like room and board, etc?